The 2017 Dodge Durango straddles the line between midsize-crossover SUVs and full-size body-on-frame SUVs. It's only a bit smaller than the Chevy Tahoe, for example, offers a V8 engine, and can tow up to 7,400 pounds. But the sleek styling inside and out is clearly designed to compete against the Honda Pilot, GMC Acadia and other car-based crossover SUVs. White color matching mirrors and grill. Black rims. Even a heated steering wheel. I recently bought a 2017 Dodge Durango r/t. It is so far the best car I have ever owed. Rating it as 5 out of 5 is an understanding. I have 2 kids and plan to have more is my reasoning in purchasing my Durango. After test driving for months the Durango has the most room, best features and overall an exceptional ride. I chose the r/t package because I love the black rims on the white car that I purchased. Also it has really cool red stitching in the black leather seats! Backup camera, navigation, electronic everything. Even the third row of seats headrest folds down! The r/t also features a hemi v8 engine. Which is very fast and capable of passing anything on the freeway. If I had one complaint it would be gas mileage. I have to say thought for a engine that big it is pretty good. Overall like I said before best car I have owned. The new and improved Dodge Durango. I am the proud owner of a 2017 Dodge Durango gt. I am a mother of 3 so having a vehicle with seating for all of us is great. The safety features are the best which was a necessity since I am the taxi driver for 3 little ones. Another feature I really like is the gas mileage. It is a very fuel efficient vehicle that does not cost me an arm and leg at the pump. When winter comes, the heated seats and steering wheel are fantastic! If you are in need of a family vehicle, I highly recommend a Dodge Durango! 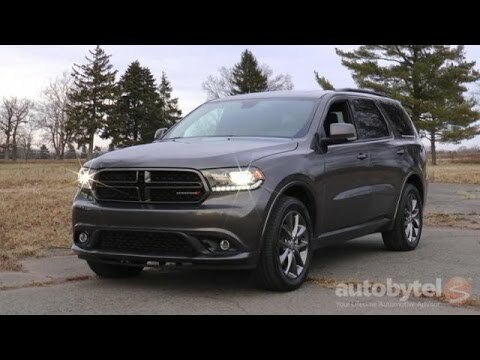 The durango is great on gas and is a great family car. The durango is very comfortable. It is great on gas. It has a 3rd row seat so I can fit 7 passengers comfortably. I haven't had any problems with the vehicle. I am not sure if I like the fact that it shuts off when you come to a stop. It can be turned off but you have to do it every time you start the car. I really like the heated front seats and heated steering wheel. It is also a very smooth ride. I really like the car and I may lease another one when this lease is done.